With Music In Our Schools Month fast approaching, I've been thinking more consciously about how integral music is in all of our lives and how important music is for children in particular. 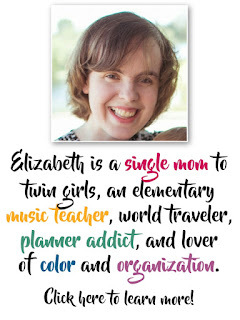 As an elementary music teacher, incorporating music into my everyday home life comes naturally, but I've talked to so many parents of young children who wish their home lives were more musical. 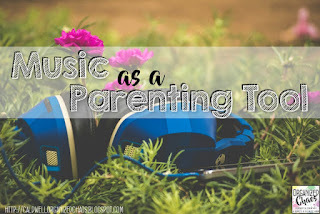 I think most all of us love to enjoy music in one way or another ourselves, but many adults are less musical as parents than they are as individuals because they feel "their music" is inappropriate for their kids (but they don't like "kid songs"), they are self-conscious about their singing or instrument playing abilities, or they just get caught up in the stress and chaos of parenting and toss music by the wayside. Today I want to remind all of us of 5 simple ways to make home life, especially with young children, more musical. No matter how good or bad of a musician you may think you are, I hope these tips will help all of us feel more comfortable infusing our lives with music! This post contains affiliate links. This does not affect the purchase price or experience in any way. First let's address those parents who think they "can't sing"- science (and my own real life experience) tells us that for most of you, that's not actually true. You just haven't learned how yet. Try taking deeper breaths, use more air, and sing a higher pitch- you may be surprised at what comes out! Or let loose, be totally silly, and belt out some opera singer notes. Yeah, that's how much air it takes to sing! 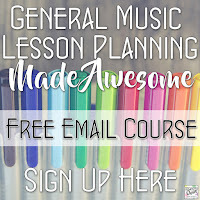 Of course, I can't help everyone learn to sing through the computer, but I've been surprised at how many adults "discover" their singing voice with these simple ideas! anything goes: it doesn't have to be a "real song"- you can narrate your day with song and get all the benefits of singing we always hear about! Have you ever watched a toddler play by themselves? How many times do they start making up random songs about nonsense? kids do not mind hearing the same song over and over- in fact they LOVE repetition. Having certain songs that you always sing for specific events can be a great way to build music into your lives- that classic "clean up, clean up, everybody everywhere" song is a perfect example! Despite taking dance classes for years as a child I am admittedly, well, not the coolest dancer. But there is something magical about dance! It is such a holistic experience and can totally change our moods in an instant. The next time you're bored, or feel the tension building as you rush around getting homework done and dinner on the table, turn on a song and start moving. I am always amazed at how quickly my daughters join in with the fun no matter how cranky they are, and how much it improves all of our moods when we do! Instruments are fun and often overlooked at home! Of course it's wonderful for children to be able to take private lessons and study a more challenging instrument more in-depth, but my advice: wait until they really do know they want to learn the instrument for themselves and have the self-discipline to practice on their own. No matter how great the benefits of instrumental study are, the stress and tears of trying to get a kid to practice when they don't want to will far outweigh the benefits. I love having a small collection of instruments that my daughters and I can tinker with whenever the mood strikes. When the girls were toddlers, I had a box of small percussion instruments- a glockenspiel, a hand drum, some rhythm sticks and egg shakers. Those still get a good amount of use even now, and you can pick them up pretty cheaply at stores like Walmart/Target, or Costco/Sam's Club. Sets like this one are great for really young kids if you don't have anything already. Now that my daughters are in elementary school, we love playing on slightly more sophisticated instruments too. We have a piano, a ukulele, a cajon, and a melodica that they love playing around with. 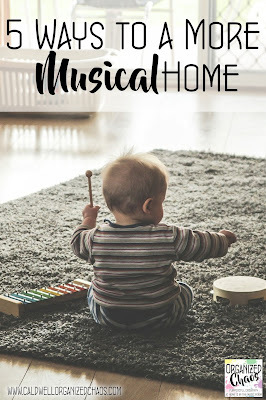 All of these instruments are sturdy enough for kids to explore, and they are fairly cost effective as well (unless you're talking about a nice piano- keyboards are cheap though)! Obviously listening to recorded music is a great way to bring more music into our lives! I find that I often am so busy trying to do all of the tasks on my to-do list that I don't think to turn on any music. But when we do remember, it is such a great way to set a positive mood in the house! It can also be a great way to get everyone to relax and wind down at the end of the day. Don't forget to try out lots of different genres and find new artists to enjoy! It's easy to get stuck in a rut, and there's nothing wrong with enjoying your favorite music over and over again, but this is the time to expand your children's musical palate, which will in turn translate to an expanded world view if they can hear, understand, and appreciate music from a wide range of cultures and lifestyles. Plus it's always great to learn something new together as a family! My last point is related to #4 but it's awesome enough to be worth mentioning separately. Instead of nagging the kids to get dressed, brush their teeth, or do their chores, try putting on a song and challenging them to get it done by the end of the song! This is also great for "time out"s- choose a calming, quiet song and tell them to stay in their spot until the end of the song instead of setting a timer. In both cases, not only does it function as a way to mark time but it also is easier for kids to keep track of how far they are through the set amount of time, and it simultaneously changes the mood! Win-win-win for everyone! I mentioned this tip, along with a few others, in my previous post on using music as a parenting tool. 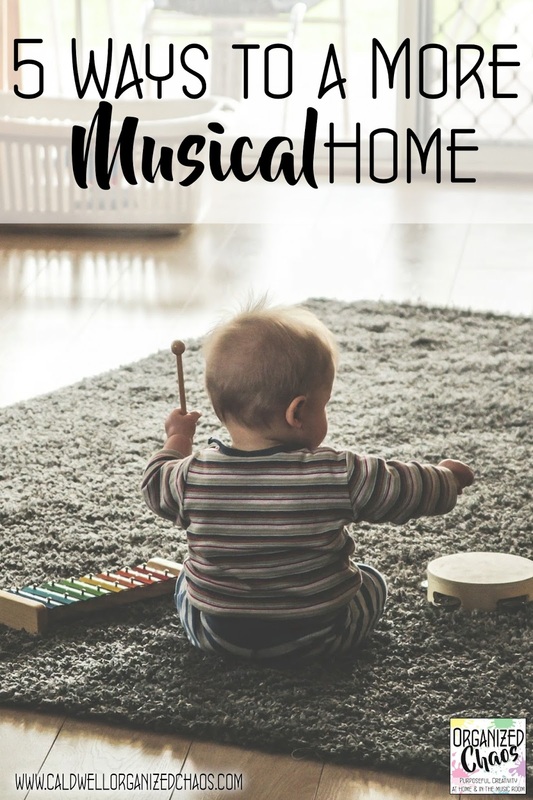 If you missed it, I highly recommend checking it out- you'll find lots more practical ways to use music to improve your parenting life! How do you infuse music into your life at home? 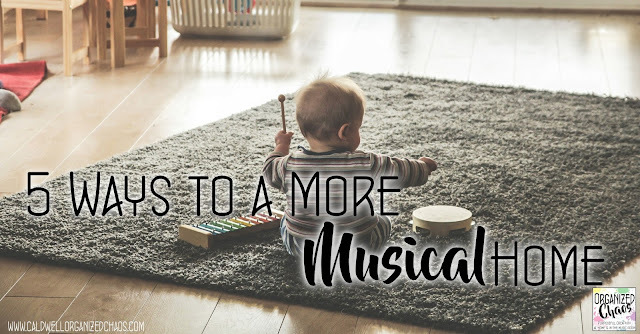 Even if you already do all of these, I'm sure I'm not the only one who could use a reminder of how many wonderful ways we can enjoy music at home in the midst of all the flurry of activities! I'd love to hear your favorite stories of experiencing music with your children in the comments below- Happy Music In Our Schools Month! Click here to sign up for the Organized Chaos newsletter!